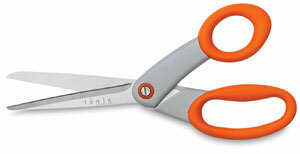 These 8½" general purpose scissors have stainless steel blades and patented ergonomic Kushgrip handles. Use for hours at a time without fatigue. They can be used for cutting fabrics, paper, and many other materials.